Extron Electronics, a leading company in the field of audio visual technology, yesterday announced the introduction of their new Quantum Ultra 305. Described as a compact modular 4K videowall processor, the Quantum Ultra 305 is a 3U, 5-slot card frame that supports any combination of Quantum Ultra input and output cards. 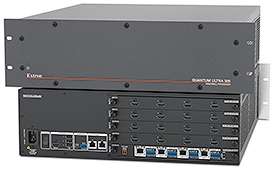 The Quantum Ultra 305 features a high-speed video bus with the same Extron HyperLane technology and real-time performance as Extron’s existing 6U, 10-slot Quantum Ultra 610. The processor, too, is slated as including a single card frame, which can support multiple output resolutions and screen orientations for simple, flexible system design. The new processor, however, also utilises a modular card-frame architecture that can be populated with input and output cards selected to match source and display requirements. Multiple card frames, therefore, can be configured and operated as a single system to accommodate any size videowall, and RS-232 and Ethernet interfaces allow multiple direct connections for control systems. If you would like to discuss your requirements for Extron audio visual solutions please call us on 0800 195 4825.